I assume all food bloggers are constantly on the search for new and tasty foods. Quite a few of them concentrate on healthy foods. A certain percentage would focus on either vegetarian, vegan, raw, gluten-free, sugar-free or fat-free foods. I find interesting approaches to foods on all these blogs and websites, leaving the ethical perspective out at this point. However, none of these ways of eating would work for me exclusively in the long run. I am not a nutritionist, I still have to learn a lot about the health benefits of foods: vitamins, minerals, glycemic indexes, natural foods, food allergies and intolerances, etc. My approach to food is a combination of reading about nutrition and listening to my body. I am slowly coming to the conclusion that a low glycemic diet is my way to go: Foods that keep the blood sugar levels even, foods that avoid quick highs and lows. My believe is that once you master a low glycemic diet (which should include lots of vegan, vegetarian, natural, raw and sugar free), you don't have to worry about calories anymore. Your body will take in just as much as it needs. No more. Period. I don't have to loose weight, far from it. It had been a mystery to me for a long time, that I could eat "whatever I wanted" without having to worry about my weight, when other people seemed to "eat hardly anything" and were very concerned about putting on weight. I truly believe it is all about the composition. Now here is one of my current favorite lunch salads: whole grains tossed in melted butter and Parmesan cheese, combined with some raw veggies; light yet filling, refreshing, full of of vitamins and with a low GI, as it uses a grain with one of the lowest GIs: bulgur or cracked wheat. This salad will surely get you through the afternoon. In fact, I love to eat this after my marathon training sessions when I need to stock up on carbohydrates. Complex ones work best, as they release their energy slowly and my torn muscles can recover quickly and will be ready in time for the next training session which will be 24 to 48 hours later. The marathon that I am training for is only in January. But already now I can say that the right nutrition is a main key to get you through the training. Whatever makes you run a marathon (hopefully), can't be bad in life, can it? Well, we will see in January, after the marathon. Cook the coarse Bulgur in 1 1/2 cups of salted water. Bring to boil, then simmer until tender, about 10 minutes. Drain excess water. In the meantime, chop the cucumbers, tomatoes, and arugula. 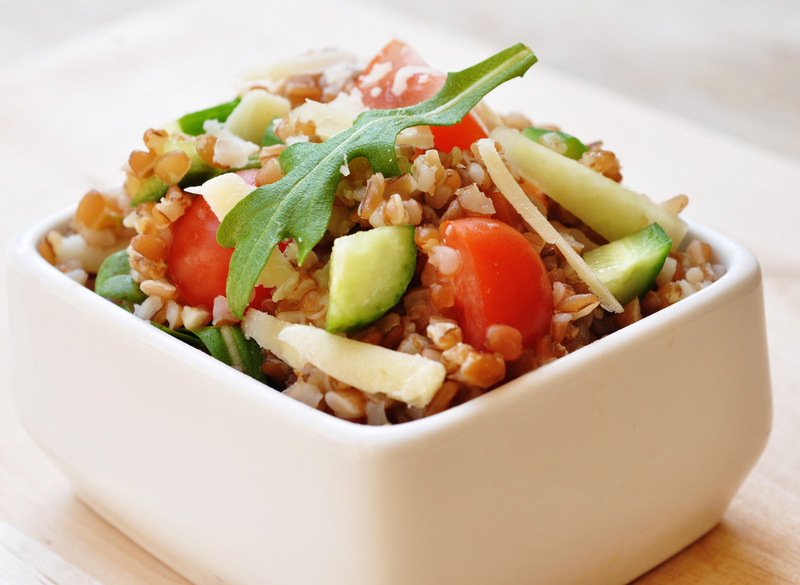 Transfer the warm Bulgur to a serving bowl. Stir in the butter. Then toss in arugula, tomatoes and cucumber. Sprinkle generously with grated Parmesan. Ready to serve.